The Rio Grande Yampa Valley Mail used just one PA, but the train consisted of only an RPO and a small coach. I added a B unit to reflect earlier times when longer trains ran from the main line at Bond, up to Craig. 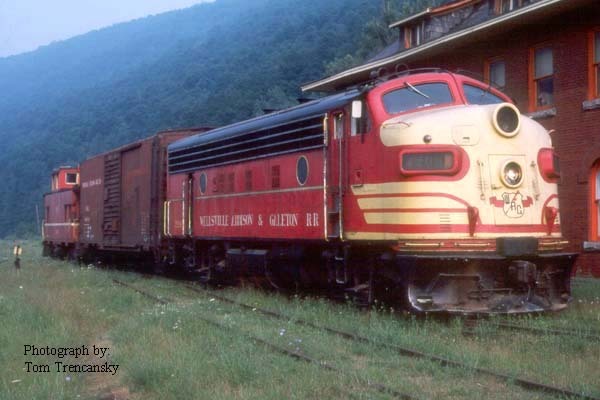 The Wellsville Addison & Galeton, towards the end of its life, used a single F7 on their local train, wye-ing it at each end. I have 2 Athern F7A both with dcc and sound I bought them as a pair to increase my chances of having them match. The sound of the two of them running in consist is almost overwhelming. If you heard it it would justify having the 2 units with sound. It makes sense to me that if you wanted sound, then both units should be so equipped, if for no other reason than the engine sound. I visit the local freight yard frequently, and the sound of 3-C44s throttling up is awesome. I borrowed a History of the Great Northern Railway from the library & see pictures mostly of more than one powered unit in the 20th century trains. I just ordered the F7B unit from Intermountain that is made for the F7A I have. So much for spreading out my expenditures gradually over time! My motto is: "Spend it while ya got it", or as my wife says: "It's only money." Or, as "King" George says, "Never saw a luggage rack on a hearse." I figure if I can't take it with me, I'm not leaving any behind for my kids to spend. You will enjoy the AB setup. You're not spending your money you are spending his .. I wouldn't be spending this much on model trains if I hadn't inherited my dad's estate. People who lived through the Great Depression learned to save their money when times improved. I like helping other people spend their money. I lived through the Depression of 1960s, really tough years. But now I'm retired and out of debt, don't need the money anyway....think I'll buy some more trains. After this week, when my Intermountain F7B DCC with sound unit arrives, I should be spending less, now that I have my basic layout, a freight train & a passenger train. Sometime, I'd like to add sound to my Spectrum EMD SD-45 with DCC. 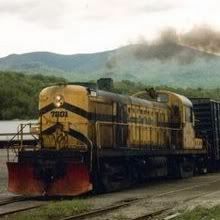 It is powerful, pulling all 16 of my freight cars with ease. The F7A can use some help pulling its 8 passenger cars, so I hope that the F7B will make a difference. Then I can help others spend their money, too.